Election Night always has marked memorable moments in my life; none more so than the first Tuesday in November four years ago. Sure, 2008 saw the United States of America elect the first president of mixed-race origin in our history. Wait. Hold up. Mixed-race? Aren’t we all mixed to at least some degree and extent? Why didn’t I just type African-American? Because there remain more than a few zany crazies out there who see the word African and forget to keep reading, instead preferring to think that Barack Obama is as Kenyan as his father was — when, in fact, President Obama is much more Hawaiian by birth, if not by skin tone and facial features. But that’s not what made Election Night 2008 so memorable for me. Just ask my mother. She has no memories of that day or night, because she underwent open-heart surgery that day at Massachusetts General Hospital in Boston. Before you start frowning, turn that upside down and flip it around, because my mom survived and cast her ballot before the surgery (as did my father and I, via absentee). In 2004, the Boston Red Sox reversed the curse and won their first World Series in 86 years, so even though my childhood friend and I were physically on the Arizona State University campus when Sen. John Kerry debated President George W. Bush that October, that’s not really what sticks with me. In 2000, I was a reporter and columnist at The Sun newspaper in Bremerton, Wash., across the Puget Sound from Seattle, up late with everyone else on staff as Florida went Gore, then Bush, then into the abyss of dangling chads — that was when I was a serious newspaper reporter first, comedy fan and aspiring stand-up comedian second. In 1992, retired NBC and CBS network news anchor Roger Mudd bought me and my fellow “Politics and the Press” students pizza and beer as we found a room on the Princeton campus where we could hook up three separate TVs to watch the votes come in on multiple networks for Bill Clinton, George H.W. Bush and H.R. Puffinstuff Perot. Ah, memories. So, yeah. Not a lot of laughs there. Sorry about that. Can’t turn back the clock. I’ll do better next time, which is this time, which is tonight. Tonight, we’ll all be making new memories, and I’m hunkered down in the Edison Ballroom in midtown Manhattan’s Theater District, just off Times Square, behind the scenes with Comedy Central as it prepares its second Election Night of live coverage by The Daily Show with Jon Stewart and Stephen Colbert’s The Colbert Report. I’ll be letting you know how some of America’s favorite funny people handle the evening. Before. During. And even afterward. Election returns will start coming in from the East Coast states at 8 p.m. Come join me as we soak in these new memories, won’t you? And please, make your own voices heard in the comments! 8 p.m. EST Polls close in several states. Those states that normally vote Democrat or Republican majorities continued to do so, although Florida, Pennsylvania and Virginia among the states that no broadcast nor cable networks want to predict just yet. 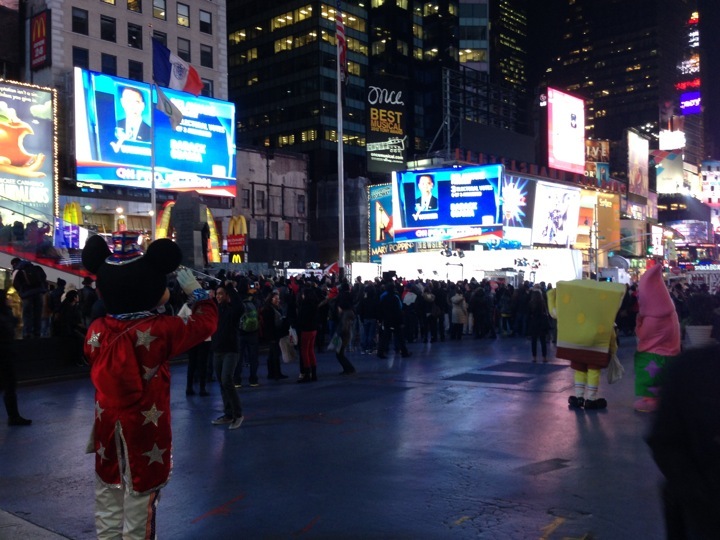 If you thought 2012 was a Mickey Mouse election, then I beseech you: Stay away from Times Square! Mickey Mouse is here, saluting CNN and Wolf Blitzer? Ay, the end must be nearer than me thought. 8:15 p.m. 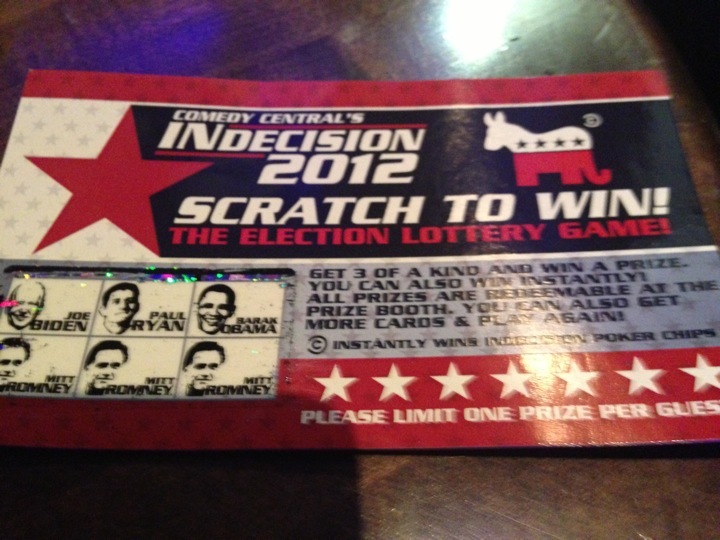 Comedy Central produced these lottery-style scratch tickets for Indecision 2012. So if nothing else, Mitt Romney’s a winner on this ticket! 8:30 p.m. The Huffington Post Comedy vertical team, a guy from The Hollywood Reporter, Dylan from Laughspin and others enter our liveblogging chamber, where Comedy Central has set up several surge protectors to connect, as well as high-tops, tables and a protected WiFi account. 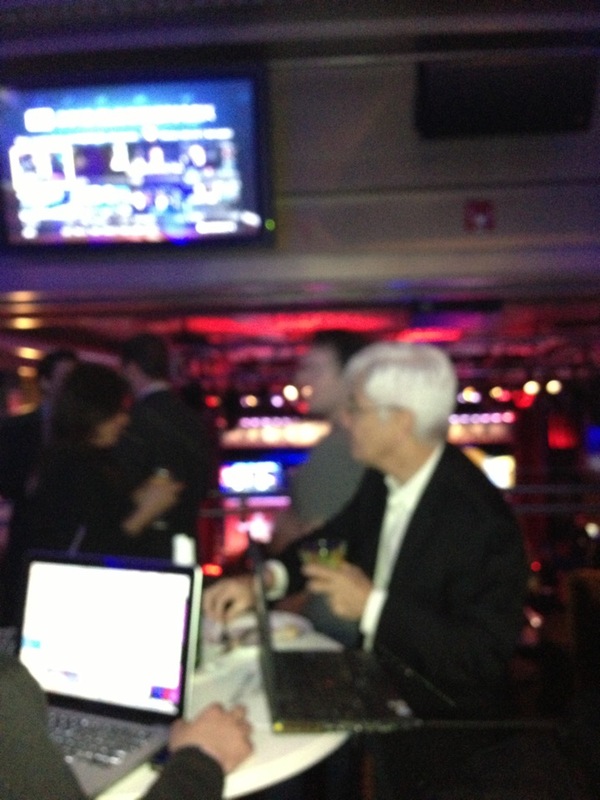 Oh, there are three other yahoos already here in the not-VIP section of the Comedy Central bash, but they’re probably not Yahoo! yahoos. Team Lycos? 8:45 p.m. Hey, look, it’s Bill Carter from The New York Times! Carter told me that he witnessed the first-ever live Election Night edition of The Daily Show with Jon Stewart four years ago. This time, he’s just here for the party. Unless a source wants to leak any news his way. Or he decides to write another book about late-night TV “wars.” You know. 9 p.m. David Wain and his wife, 2012 New York Television Festival award winner Zandy Hartig, are in the house. As are Christian Finnegan and his wife, the erstwhile publicist and memoirist Kambri Crews. Maybe I’ll chat them up if and when things calm down here. The party music is as loud as the party people are at this hour, because everything else is still too early, too close to call. 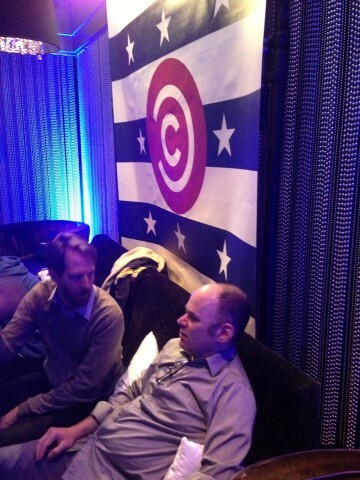 9:45 p.m. Todd Barry sits in repose, as Matthew Love from Time Out New York chats him up underneath a Comedy Central banner. I interviewed Barry on camera a few minutes before snapping this shot, but the dance hits from the 1970s and 1980s are blasting at such a loud volume, both Barry and I fear that none of it will take. In the meantime, here’s some news from Mr. Todd Barry: He had to postpone his 25th anniversary in comedy show — originally scheduled last week for The Bell House in Brooklyn — due to Hurricane Sandy. It’ll now be held in mid-December. Here, Todd Barry shares his thoughts on the election with The Comic’s Comic. Roll the clip! 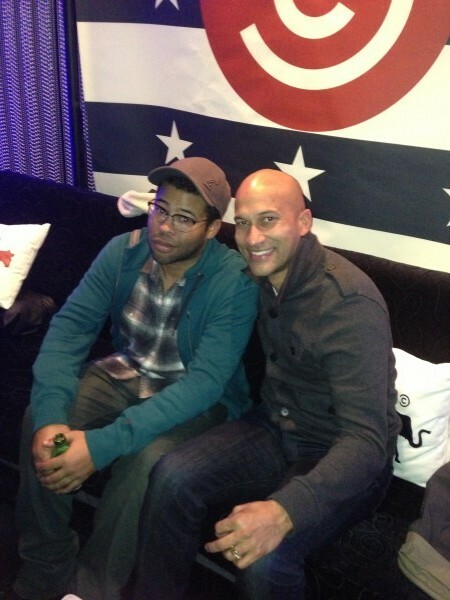 10:30 p.m. Key and Peele in the house! It’s Keegan-Michael Key and Jordan Peele, stars of the Comedy Central sketch series, Key and Peele, now two seasons in with their portrayal of President Obama (Peele) and his anger translator, Luther (Key), of which even the president himself is a fan. So, does Comedy Central automatically renew your show based upon tonight’s election results? 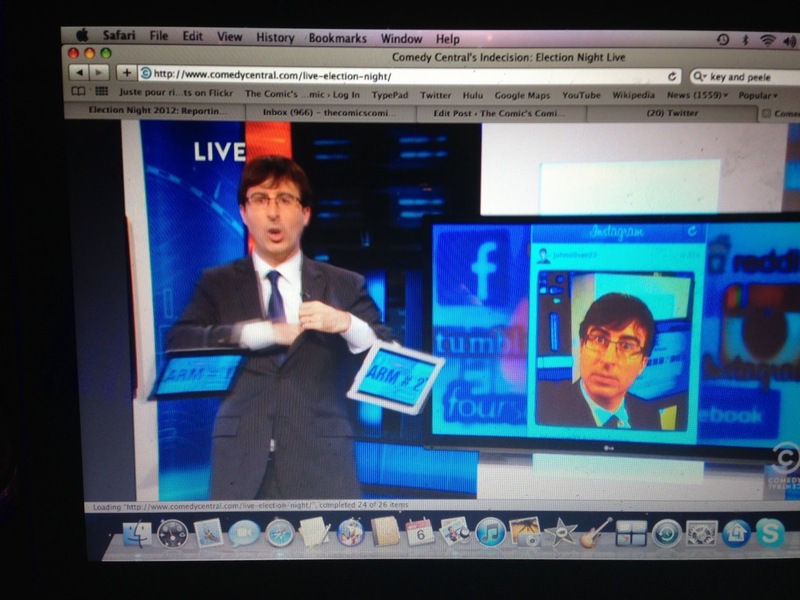 11:05 p.m. John Oliver is LIVE on The Daily Show with iPads on his arms, taking real-time Instagram photos of himself. Because it’s 2012 and we can. Yes, We Can. 11:15 p.m. As several broadcast and cable networks call Ohio for Obama, and with it, the president’s re-election, Jon Stewart is on Comedy Central interviewing Samantha Bee on the tail end of a pre-taped segment in which Bee interviewed “undecided” voters. But it’s decided. We decided. Even FOX News decided, and they still claim that they merely report and we decide. We decided! 11:21 p.m. “And the presidency is projected to remain in control of the Democratic Party,” Stewart says, coming out of a commercial break, being as subtle as he possibly could after first saying that the U.S. House of Representatives and the U.S. Senate will remain in Republican and Democratic control, respectively. 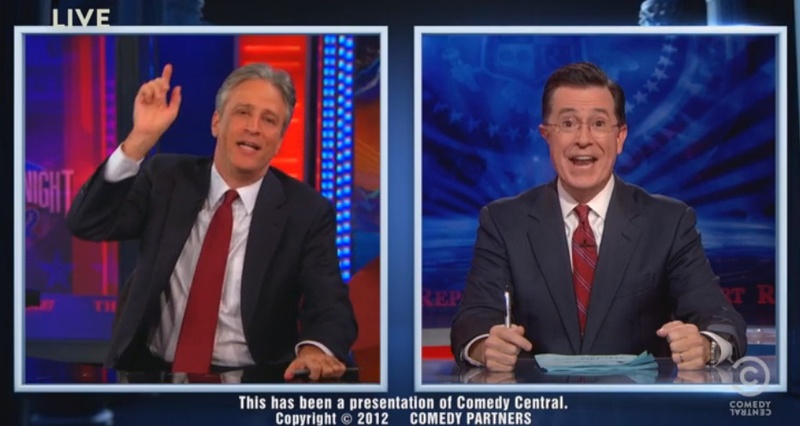 11:30 p.m. Stewart tosses to Stephen Colbert for The Colbert Report. “I told you…no spoilers!! !” Colbert pleads, after the facts. 11:40 p.m. I’m at a Comedy Central party watching Stephen Colbert do a live broadcast, but everything the Internet is telling me says that all of the high comedy in the world is happening RIGHT NOW on FOX NEWS!?!?!?!?!?!?! Irony, thy taste is delicious. 12:30 a.m. Speaking of Key and Peele, they’ve delivered Obama’s victory speech before Obama has (or before Romney has conceded, ahem). Roll the clip! 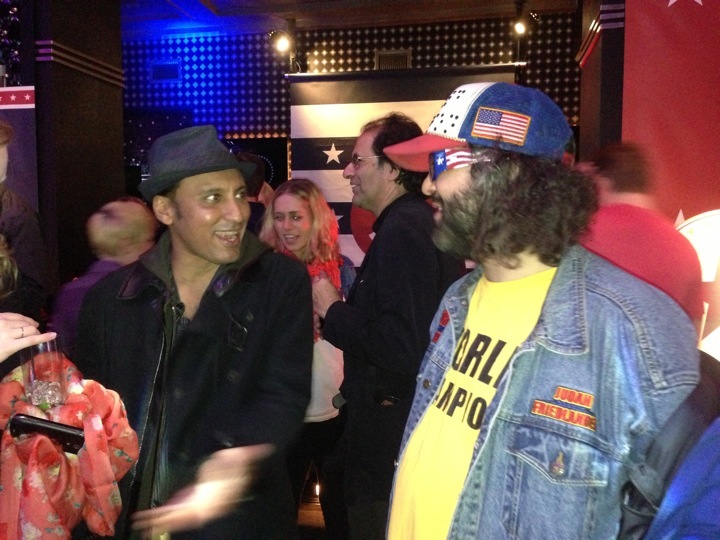 12:45 a.m. Comedians and staffers from The Daily Show, including “correspondent” Aasif Mandvi, have made their way from The Daily Show studios on the Upper West Side down the several blocks to the Comedy Central party. Here Mandvi clearly has some insight to share with Judah Friedlander and others. Not pictured but close by: comedians Hannibal Buress and Seth Herzog. Herzog made his own patriotic pants, white with red-painted stripes of tape. These colors don’t bleed. Except when they do. Because he painted the tape. 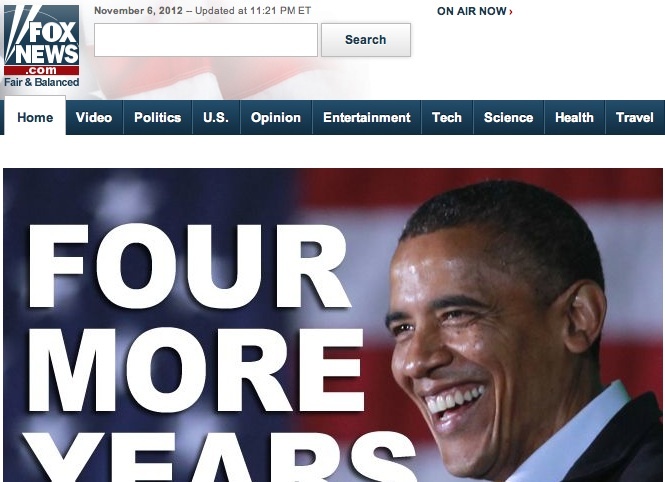 1 a.m. Mitt Romney still hasn’t conceded the race to Obama. Neither has Judah Friedlander (30 Rock), aka the “World Champion.” What’s that? You didn’t know Friedlander was even running for president? While Roseanne Barr actually was on the ballot in three states this year as a presidential candidate, Friedlander’s campaign used, well, um, different tactics. I’ll let him explain it. 1:10 a.m. The party’s over. Despite not hearing from either Romney or Obama personally yet, Comedy Central has closed down the bar and kicked everyone out of its party. A small crowd is gathered in front of CNN’s Election Night TV screen and cameras half a block away in Times Square. Democrats, Republicans and independents — “Blue State” residents and “Red State” tourists — standing together in the freezing cold, a nation united in its desire to be on TV.